This article originally appeared in the London Evening Standard of 19th April 1951 (shortly after a letter to the Times on a similar topic). It was republished in the July issue of DISCOVERY Magazine the same year. "A GREAT deal of publicity has been given to Habakkuk — the unsinkable aircraft carrier which was to be made out of reinforced ice. That publicity was misleading in that it created the impression that Habakkuk was a practical proposition, whereas in fact it belonged to the realms of fantasy —it is probably no accident that something very like Habakkuk was brought into George Orwell's futuristic novel, "1984". In order to keep our records of wartime research and invention straight, we print this article by Sir Charles Goodeve, who was Assistant Controller for Research and Development at the Admiralty during World War II." ONCE during the war an inventor brought forward the novel idea of a searchlight that would itself bring down any aircraft caught in its beam. The idea was to provide the searchlight with a button which when pressed would solidify the beam. By rapidly turning the searchlight downwards, one could 'wang' the aircraft on the ground. The incidental details as to how to solidify the beam were, according to the inventor, "merely matters of research and development easily solvable by anyone who really believed in the idea". Many inventions of varying degrees of absurdity, as well as some useful ones were put forward during the war, but none produced a dislocation of the Allied effort to a fraction of the extent achieved by 'Habakkuk', a proposal put forward by Geoffrey Pyke. He himself named this grandiose scheme after the prophet who said: "I will work a work in your days which ye will not believe, though it be told you." Wars had for long been fought with steel and explosives, and more recently with aluminium and electrons. To these was now to be added a new element of war, ICE. "Ice," it was pointed out, "was plentiful and didn't sink. Let us build large unsinkable aircraft carriers of ice and thus provide air cover for an attack on a remote and unprotected part of France. Steel limits the size of our carriers to tens of thousands of tons; with ice we can throw off our shackles and build carriers of millions of tons each. "Ice is plentiful! Ice is unsinkable! Ice is hard! The enemy will never suspect it! Ice will win the war!" At first the scientists and engineers working on their radar, their jet-propulsion, their tank-landing craft and the thousand and one other developments which were to be put in the hands of our fighting men, laughed. Ice may be hard, but it had no strength. Their laughter turned to alarm when they learned of the long-haired scientists, the admirals and generals who had been swayed by the magnetic personality of the inventor. Here was no ordinary man; this was no ordinary way to win a war. One scientist showed that the wave-functions of the hydrogen atoms in ice bore a close relation to those in concrete, and therefore it should be possible to make ice as strong as concrete (forgetting, of course, that concrete has little strength other than that of its steel reinforcement). An engineer who had already built an air-raid shelter offered to build the first Habakkuk. Pyke put it to Lord Mountbatten, Chief of Combined Operations, on whose staff he Was; Mountbatten passed it to the Chiefs of Staff who passed it to the War Cabinet, the War Cabinet to Churchill. Winston, an inventor of no mean repute himself, wrote: "Let us cut a large chunk of ice from the Arctic ice-cap and tow it down past Cornwall, fly on our aircraft, and tow it to the, point of attack." Pyke's followers were triumphant. "Churchill approves! The war will be won by ice! All that is left are merely matters of research and development easily solvable by anyone who really believes." Orders flew thick and fast, committees were set up. The voices of reason were shouted down by cries of "Obstruction". These in control of important war programmes had the Hobson's Choice of either fighting this absurdity or of ignoring it as far as possible, the objective in either case being to confine the dislocation of effort. Their success was indifferent. At one stage they thought it would be a good idea to send the whole party to Canada, where the winter might cool its ardour. The Canadians were sensible people; they would get this monstrous fantasy under control. But ahead of the team went this message: "This was Canada's opportunity to play a part in history!" Far up in the Rocky Mountains a lake * was chosen. In great secrecy, a camp was built and an experimental model was constructed. Hundreds of skilled designers were put to work all over the country designing refrigerating plant, remotely operated electric propulsion motors, etc., they knew not for what. Came the spring, and with it one conclusion from the trials; ice melts. Once again the voices of reason could be heard. "Ice has no strength, ice melts, ice is cold, the steel required to hold the ice together, to build the refrigerating plant, the propulsion machinery was far more than would be required to build conventional aircraft carriers of much more effective fighting power. "Conventional?" you say. Have you no imagination? Ice is the new element of war. All would have been well if it hadn't happened that at this moment one of the many parties detailed off for research into the problems of Habakkuk discovered that ice could be given some strength by incorporating a large amount of paper-making pulp in the water before freezing. 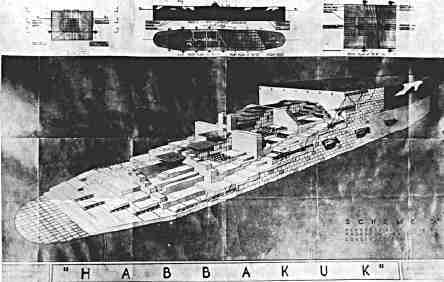 This cut-away section shows the design which was proposed for "Habakkuk", the iceberg aircraft carrier which was intended to replace aircraft carriers of the size of H.M.S. Illustrious. The frozen block did not yield easily to the hatchet, and a bullet fired at it went in so smoothly that the ice reformed behind it. The followers were elated and called this material Pykrete in honour of their leader. ""Pykrete," they said, "is not only unsinkable, but it is self-healing against bullets, bombs and torpedoes! Never mind if we have to reduce all the allied newspapers to letter size. We've proved that research will solve all our problems if the obstructors can only be got out of the way." Designs and plans for construction were rushed ahead. Each Habakkuk required 40,000 tons of cork insulation, some thousands of miles of steel tubing for brine circulation and reinforcement, four power stations, and endless additional complications, especially in the building stage, even before you started making it into an aircraft carrier. At that, the maximum Speed would only be six knots. (By leaving the ice out and converting the tubing to ship's plates the whole would have been able to go four times as fast.) . But there was one obstacle that even research and faith could not overcome.. Great Britain hadn't the resources to build even one Habakkuk. However, armed with blocks of Pykrete, a revolver and plenty of rounds of ammunition, and wave-mechanical equations of hydrogen atoms, the team descended on the Quebec Conference, held to decide on the plan of attack on the European continent. Fortunately, a decision was made not to wait for Habakkuk, but to rely on the daring, but sound, scheme which became known as the Mulberry Harbour. Nevertheless, this conference of the heads of the three great States, U.K., U.S.A. and Canada, together with their Chiefs of Staff, decided that a Habakkuk should be built under the supervision of an Anglo-American-Canadian committee with a secretariat in the U.S. Navy offices in Washington. But at such high altitudes came a new discovery. Not only does ice melt, but it evaporates! and so did Habakkuk. The great three-power committee never was convened. The followers became dispersed or else cooked in the heat of Washington. * This was Lake Patricia in Jasper National Park. Things have been declassified a bit since 1951, so the link has some more details on the project. Aside from that misleading "battleship" term used in the promo (but not in the text) it's a pretty good article. I thought this was an hour well worth spending. A lot of well informed comment, including an interview with one of the workers at Patricia Lake. Way to go, CBC...!